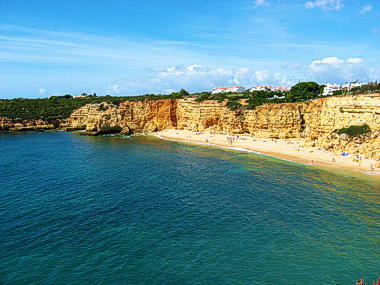 Within the Central Algarve one can find slightly more 'populated' and famous villages and towns such as Albufeira and Vilamoura. This creates an array of beaches with a wider selection of tourism, sports facilities and vibrant nightlife whilst still allowing a reasonable selection of more 'natural, secluded and little frequented stretches of golden sand. Viewed from the sea, the coast is a series of brightly coloured cliffs, strangely shaped outcrops and caves, whose almost unreal beauty is set off by the clarity of the waters. Between the rocks long stretches of sand alternate with tiny coves that can only, be reached by boat. The Grande Beach, translated 'Big' Beach, is located next to the village of Ferragudo separated from the Angrinha beach by the Fort of São João de Arade and is facing the Rocha beach on the other bank of the Arade river. As well as a rather large parking facility this beach has immediate access to restaurants, public showers and toilets, a children's play area and the presence of a lifeguard during the summer. 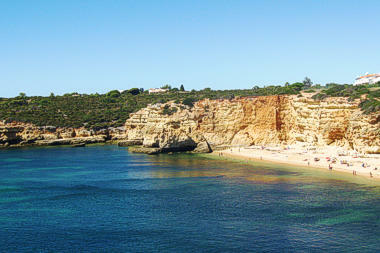 A small beach of calm waters, the Pintadinho beach lies on the west side of the Ponta do Altar cliffs. Equipped with a volleyball net, food and beverage outlets as well as a small parking lot. The charm of a fishermen's beach and a small bay with crystal clear water. A cosmopolitan tourist centre. Boats can be hired to visit caves and isolated beaches. 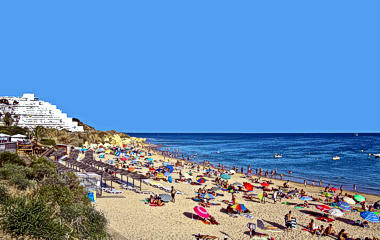 The Carvoeiro Sol Hotel is facing the beach and the Hotel Apartments Solferias is 800 metres north. Scenic location between rocks and cliffs. The Vale Centeanes Beach also has good conditions for surfing. 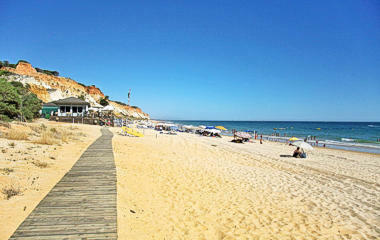 The Hotel Baia Cristal is overlooking the beach and the Rocha Brava Resort is 900 metres away. Best described as a long stretch of sand between ochre cliffs, it is a peaceful locale with tourist facilities. 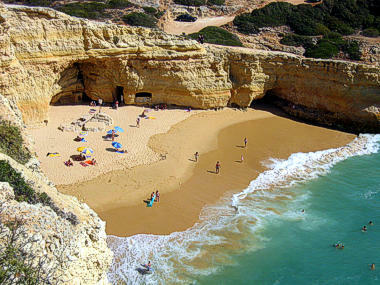 A small beach which can be reached along the coast by nay of rocks and natural tunnels. Little visited and quiet, it is possible to rent sunbeds. It has toilets and is watched by a life guard. Reached by the same access as that of the Marinha Beach, the Albandeira is also known to be little frequented and secluded. There are restaurants and bars, along with a car park very close by. The nova Beach is separated from the Senhora da Rocha beach by the spur of rock on which stands the Chapel of Nossa Senhora da Rocha. It is possible to hire boats to explore the coast or get to isolated beaches. Apart from this and a parking lot it offers no other type of services or facilities. Directly linked to the Nova beach by a tunnel, this cove is sometimes visited by small fishing boats which render the scenery very picturesque with the Chapel overlooking the beach. Along with showers, bathrooms and restaurants, it is also possible to acquire sunbeds for the day. Although the county of Silves is more spread out within the interior of the mainland, it does however sport two main beaches of interest. The Armação de Pêra and Grande beaches. It was for centuries a fishing village, a focal point for fishermen attracted by the abundance of fish especially, sardines and tuna, which was salted and sold in the south and centre of Portugal. These days, the fishermen's nets are still to be seen but it is to the tourists who come for its broad sands and warm waters that Armação de Pêra now ones its lively, cosmopolitan atmosphere. It offers ample parking space, there is also a camping very nearby, showers and public toilets, a first aid health centre, a beach football and volleyball area. The Holiday Inn (former Hotel Garbe) is right on the beach. This very long beach, definitely earns its name of 'Big' (Grande) Beach. Stretching as far as the eye can see, the beaches dunes occupy 3 kilometres in length, creating a very scenic landscape with hardly a human being in sight. Known for bird-watching and aromatic coastal vegetation there is a parking as well as food and beverage outlets and toilets. The beach is watched by a coast guard during the summer months. 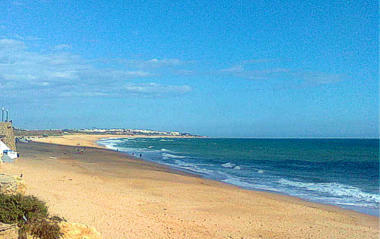 This beach is a prolongation of the Silves Grande Beach. In order to access it one must cross the Salgados Golf Course. The beach has parking space, is watched during the summer, has a restaurant and has facilitated access for disabled people. An expanse of sand that stretches for miles, between cliffs. It is equipped with a wide variety of tourist facilities. In the direction of Albufeira there are two small beaches that are quiet and little visited however it does have in close proximity a fair amount of facilities such as a car park, toilets, a facilitated access for people with disabilities and is watched by a life guard during the summer time. This small rocky beach has intertwining paths leading up the cliffs which have breathtaking views of the beach and the surrounding coast. This scenic beach has a parking, restaurants, public bathrooms and is watched in the summer. 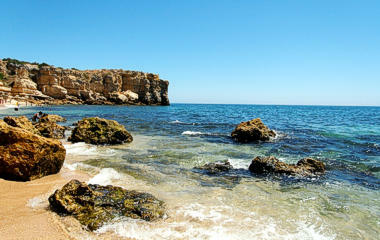 This petite cove is well sheltered and harbours an exceptional natural beauty. Facilities in this beach's area include a car parking lot, public toilets, restaurants and coast guard watch in the summer. 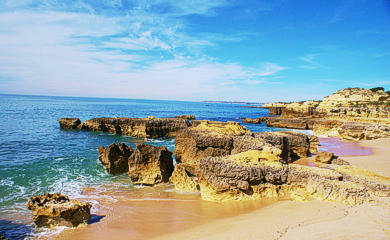 Nestled amidst colourful cliffs, the Coelha beach although small is well sheltered from the winds. It has sunbeds available to rent and apart from the presence of showers and toilets is also watched by a coast guard during the summer. Known for its great beauty the São Rafael beach is close to the Ponte Pequena and Ninho das Andorinhas, locations where fascinating rock formations can be found. The CS São Rafael Hotel is 600 metres north. 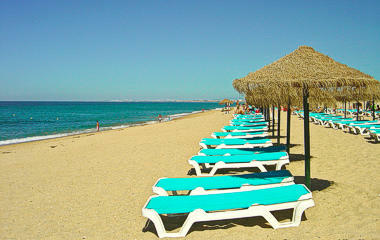 The beach combines all comforts such as car park, food and beverage outlets, public toilets and sunbed rental. Set apart by its unusual landscape of pine trees and characteristic rock formations this small beach is located in a sheltered cove. The CS São Rafael Hotel is 550 metres away. This beach is watched during the summer season and has an easy access from a parking lot and restaurants. The Peneco beach is overlooked by the Boa Vista Hotel in the centre of Albufeira, and is offering all the facilities of a town beach. This wide beach owes its name to the Inatel building located at its west end. 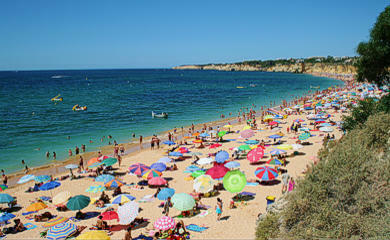 It might be quite crowded during the summer due to its proximity of the town of Albufeira. Bar and restaurant, parking facilities, rental of sun shelters and beds, public toilets, lifeguard during summer, accessible by disabled people. These beaches occupy a very long part of the shoreline. Its western end has more tourist and sports facilities whilst its east end tends to be more devoid of human activity of any kind. The Aldeia Hotel is 500 metres north. The adjacent car park is a paid one, other facilities include toilets, lifeguard watch and food and beverage outlets. 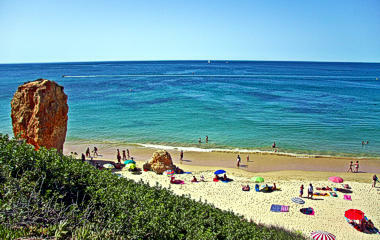 This beautiful beach has a promenade and is surrounded by deep and gullies and pine trees. The Alfagar Apartments have a direct access to the beach. There is also a car park, toilets, and several food and beverage outlets in its immediate proximity. This beach has rather interesting colourful rock formations and gullies. It is accessible to the disabled and also offers toilets, restaurants, car parking facility and has the presence of a life guard during the summer months. 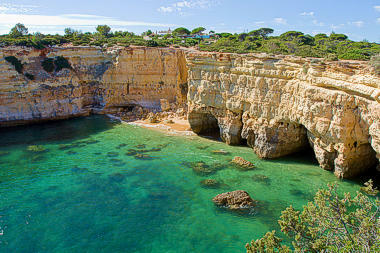 Located by the small fishing village of the same name, Olhos d'Água literally means 'eyes of water'. Restaurants and tourist facilities are found plentiful and very nearby. 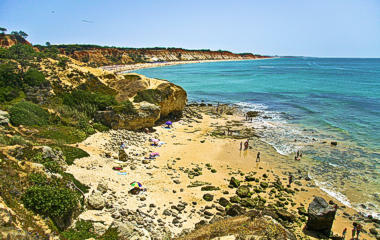 Endless miles of beaches fringed by the green pines and the many reddish colours of the surrounding cliffs. Tourist and sports facilities available. 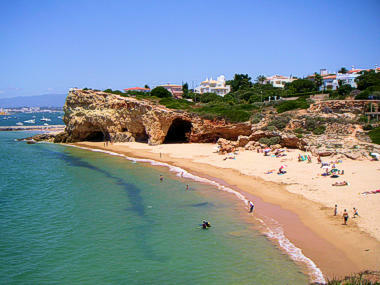 The Sheraton Algarve Hotel has its private beach club on the beach. There is a parking area in its vicinity as well as public toilets and food and beverage outlets. 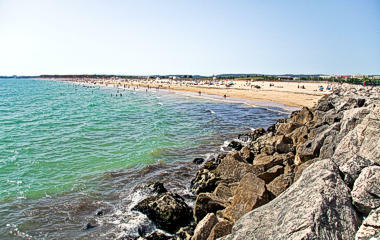 The beach is watched during the summer days and has a facilitated access for disabled people. This beach has a rather challenging access that is not recommended for vehicles as it is winding and devoid of tarmac. Aside from public bathrooms and the fact that there are restaurants there is also extensive parking space. As it is quite close to the surrounding farmland and due to its progressive absence of cliffs this beach is slowly becoming known as the beach of Tomatoes (Praia dos Tomates) which is twice as funny when you realize that 'tomatoes' in Portuguese also refer to a man's family jewels. This beach offers a large array of facilities including rentable sunbeds, bars and restaurants, showers and toilets, parking lot and easy access for the disabled. 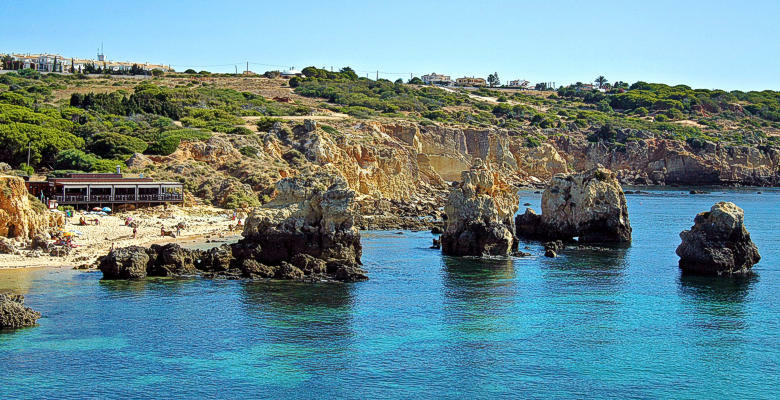 Thanks to its golden sands and sunny climate the whole of the coast has become a major centre for beach holidays and includes some of the best tourist facilities in the Algarve. 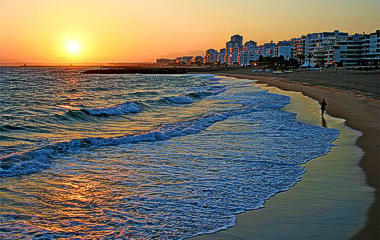 Vilamoura's attractive beach is complemented by a tourist development that ranks with the biggest and most prestigious in Europe. Due to its proximity to the cosmopolitan centre it has a very complete array of facilities from restaurants and bars to water sport activity centres. The above picture was taken from the Tivoli Marina Vilamoura Hotel. Once a simple fishing village, Quarteira has become a cosmopolitan tourist centre. Its past identity can be glimpsed in a 17th century church and a few houses decorated with coloured borders. This beach offers many services such as sunbeds for rent, a large variety of food and beverage outlets and is under coast guarde watch during the summer. The Quarteira Sol Hotel is 150 metres away. Found at the end of Quarteira beach, the Forte Novo beach hosts a more natural setting as we are moving away from the direct proximity of Vilamoura. However its does have the basic facilities; car park, toilets and restaurants as well as the presence of a life guard during the sumer. This beach is frequently flooded by the Almargem stream which creates beautiful extents of clear reflecting water, providing vistas of sky and sea as well as shallow bathing pools. There is ample parking space, public toilets and is watched during the summer. There is also a reasonable offer of food and beverage outlets. Vestiges of old aqueduct and hydraulic devices can be found on this beach as well as Roman fishing tanks. 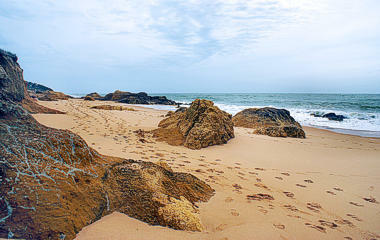 A beach that owes its unique beauty to its ochre and ruby cliffs. 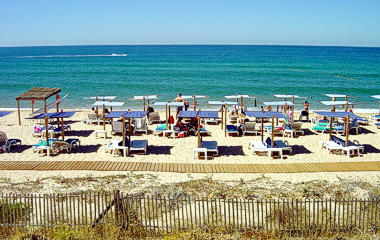 It is surrounded by the high quality tourist complex Vale do Lobo and the Dona Filipa & San Lorenzo Golf Resort. This beach has many available services from water sport activities to restaurants, sun bed rental and a life guard watch during the summer. 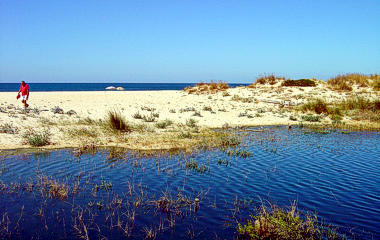 Located very near the Dunas Douradas and its neighbouring lagoons sheltered by surrounding cliffs. This beach also offers quite a few facilities and services from sun bed rental to water sport activities. It also has some food and beverage options available. This beach is located deep in a Natural park and very close to the areas scenic lagoons. There is a car park as well as some restaurants and bars. One may also rent sun beds and shelters. There are public toilets and showers available and the beach is watched during the summer months. 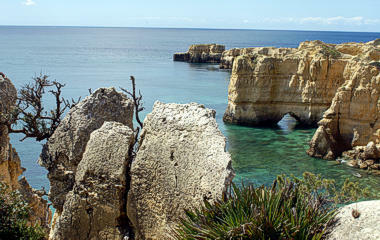 Faro, the capital of the Algarve, is reputed for its many islands which presents beaches of exceptional wonder. Very flat in scenic appearance the islands are reachable by boats and allows its visitors to lose themselves in skies, sands and waters. The Faro beach is part of a very large Peninsula which borders the Ria Formosa river, this inlet is reachable via a wooden bridge or by ferry from the Faro dock. 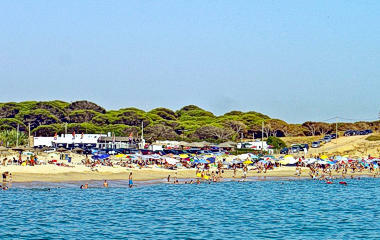 There is also a car park within reasonable distance along with restaurants and life guard. 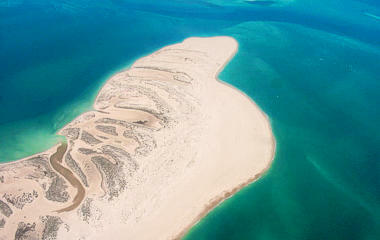 As the name suggests (Desert Island) this 'island' is reachable only by boat. A service provided by tourist facilities and certain local hotels, such as the hotel Faro, alike. There is a car park on the mainland as well as restaurants. The beach is watched during the summer. 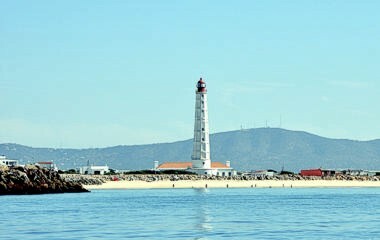 Located on the Culatra Island, this beach stretches beneath the watch of the Lighthouse of Culatra. This beach has a facilitated access for the disabled and one can rent sun beds. There are also quite a few fodd and beverage outlet options, toilets and showers. 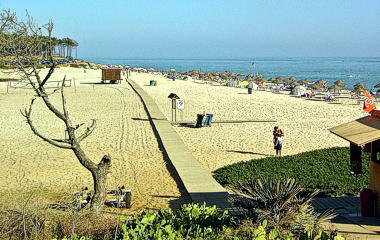 The Culatra beach is located by the fisherman village of the same name. This village until very recently still had houses made out of wood and housed only the fishermen and their families. Apart from toilet and shower facilities one can also find several restaurants and rent sun beds.